President Katherine Conway-Turner delivered her Opening Year Address to the campus community Tuesday, reflecting on the “power of place” and how the City of Buffalo’s well-known traits of resourcefulness and resiliency influence and shape Buffalo State’s role as SUNY’s Urban-Engaged Campus. 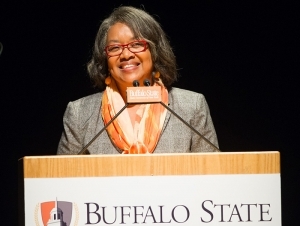 During her 40-minute address in the Performing Arts Center at Rockwell Hall, Conway-Turner urged the campus community to continue to draw on its shared traits with the City of Buffalo throughout the collective work in the year ahead as efforts continue to enhance high-impact practices and experiences for students; support faculty and staff excellence in teaching, research, and service; and expand the college’s work in civic and community engagement as an anchor institution. Conway-Turner also previewed how the campus community will work together to rebalance the college’s operating budget to best meet institutional priorities. Later this fall, she will announce a new campus budget communication committee that will provide opportunities for faculty, staff, and students to learn more about the structural deficit; plans to rebalance resources; and opportunities to generate new revenue through the creation of unique, market-driven programs. After encouraging all faculty and staff members to find new ways to contribute to student success in her remarks at the fall 2016 opening address, Conway-Turner returned to the same stage this week to report on a number of initiatives and strategies that had a positive impact, citing efforts such as mandatory advising, the consolidation of student support programs in the new Academic Commons in E. H. Butler Library, and the work the President’s Committee on Undergraduate Retention. Implementation of the Dean’s Honors Program, which enrolled 163 students in its inaugural class this fall. A $4 million gift from the Richard E. and Patricia H. Garman family to support the college’s nationally-recognized Art Conservation Department—marking the largest one-time gift in the college’s history. A more than eight percent increase in applications over the previous year from prospective students for the fall 2017 semester. Capital projects, including completion of the $21.2 million renovation of Caudell Hall and the groundbreaking for the new Jacqueline Vito LoRusso Alumni and Visitor Center. Efforts to recognize and support diversity and inclusion at Buffalo State, including receipt of the Higher Education Excellence in Diversity (HEED) Award from Insight into Diversity magazine for the fifth time and the development of the college’s “You Are Welcome Here” video and campaign.